Believe it or not, the "quiet season" for high school football is actually nearing its completion. The middle and end of May typically mark the beginning of the 7-on-7 season, which leads us through the summertime and into the start of practice in August. But, not to worry. Things will start heating up later this month and within a few short months we'll be looking at the start of the 2012 high school football season. The forecast for the Sunflower League this year is an epic one. In the meantime, feast your eyes on the Sunflower League Football Blog including player profiles, preseason rankings, recruiting news, prognostications and everything in between over the course of the next several months. Here is a look at some of the early trends in the league. Brad Strauss, QB, Lawrence, senior: The hype has been building for two seasons for Strauss and we'll see if the offensive, defensive and special teams threat can put together the final pieces of the puzzle as a senior. Last season he ranked as my Offensive Player of the Year in the SL, but this season he's the early favorite for Most Valuable Player. Remington Whitley, LB, Olathe South, senior: You'd be hard-pressed to find a linebacker anywhere in the Midwest who put up as solid of numbers as Whitley did as a junior. He combined for 162 tackles, four interceptions and three sacks, not to mention helping Olathe South to win the 6A crown. Jordan Darling, QB, SM East, senior: I'm sure some of you cringed at the thought of SM East having one of the league's most hyped players to start the season--a transfer quarterback no less--but Darling is getting a lot of love from the media and the hype meter is booming in Prairie Village. Kyle McFarland, QB, Free State, senior: If you're keeping score at home you might want to note that McFarland put up numbers that were as good, if not better than Strauss last season. The problem was he didn't gain the starting position until week three and his team didn't qualify for the playoffs. In Free State's offense there's no telling how much damage he'll do this year--and oh yeah, he's also a stellar defensive back. Braden Smith, DL, Olathe South, junior: Gigantor. The Human-Man-Child. Smith's early offer list includes Ohio State, Oklahoma, Michigan, Nebraska, Iowa, South Carolina, Stanford, Kansas State, Missouri and TCU. His 425-pound bench press and 500-pound squat max are impressing the top college football programs in America and his offer list should only grow more impressive as he completes his junior season. 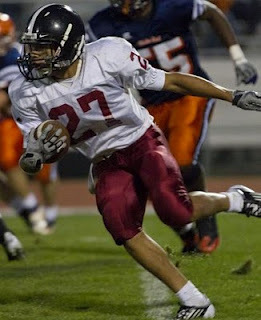 Gabe Guild, RB, SM South, senior: Coming off a season in which he combined for just under 2,000 all-purpose yards and 12 touchdowns Guild is primed for a huge year in 2012. He's going to be a workhorse for the Raiders as they work towards their first winning record in over 14 seasons. Frank Seurer, QB, Olathe South, senior: Let's make sure we don't forget about Mr. Seurer. Last season he came out of nowhere to pass for over 1,600 yards and 12 touchdowns, leading Olathe South to the 6A title. He could be the best quarterback in the league this year. Chip Sherman Cleared of Cancer: SM East's legendary head coach underwent a vicious battle with stage-3 Non-Hodgkin's Lymphoma starting last summer, and in February his cells were finally clear of the cancer after endless rounds of chemotherapy. Sherman will undergo scans every 60 days for the rest of his life, but for now he has come out on top and we look forward to seeing what he does with the Lancers in 2012 and beyond. Olathe South Seeks Second Straight Title: The Falcons return an absolutely loaded roster with the hopes of bringing home their second banner in as many years. The league appears as though it will be more competitive on paper with at least seven teams looking like legitimate playoff contenders, but the Falcons are the prohibitive favorite for now. Jordan Darling Transfers to SM East: Darling made headlines with his transfer to SM East after spending last season at Waco-Midway High School, in Waco, Texas. He's a big kid with a great arm and he'll fit right in with SM East's pass-happy offense In the meantime he'll be mulling a commitment to Kansas, his only FBS offer thus far. Gene Wier Returns to Olathe North: The timing couldn't have been better for one of the state's most legendary coaches to return to the place where it all began. Olathe North is coming off a 5-4 season in which, quite frankly, they underachieved as much as any team I've ever season. Wier won six state championships at Olathe North and he's likely just what the program needed. 1. Olathe South: The Falcons, coming off a 12-1 season in which they absolutely steamrolled the rest of the league, return over half of their starters including the aforementioned Seurer, Smith and Whitley. Be afraid. Be very afraid. 2. 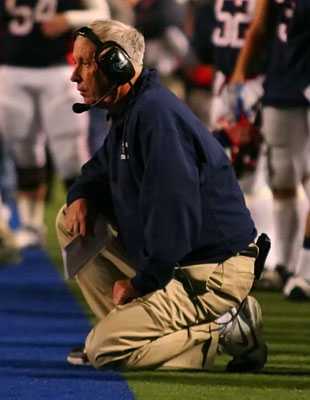 Lawrence: Last year's offensive coordinator, Mack Brown, left to take a Graduate Assistant job at Mizzou. He had a great deal of influence in Lawrence's offensive dynamics last year, so we'll see if guys like Strauss, Erick Mayo and Tyrone Jenkins can keep it going in 2012 without Brown. 3. Olathe East: The Hawks under Jeff Meyers are kind of like the Kansas basketball program under Bill Self. It doesn't matter who they lose to graduation, they're going to dominate the league and compete for a title. I fully expect Olathe East to win another nine or 10 games in 2012, the way they always do. SM South: The Raiders went 2-7 in their first season under head coach Ryan Lonergan, but they had several losses that went down to the wire and they did show positive signs with regard to coming together as a program. This will be the first season in which Lonergan has actually had control of the program for an entire year. Lawrence Free State: Free State was one of the few teams in a long time to go 6-3 and not qualify for the playoffs but they played in a loaded district and things didn't work out their way down the stretch. With a solid roster returning in 2012 they could make a run in the playoffs. Leavenworth: Yes, I know, Leavenworth. But let's be honest, they did look better last season in year two under Kevin Kopecky, winning two games. With one of the league's most athletic returning players in junior Jason Randall, the Pioneers could push for a .500 record this time around. 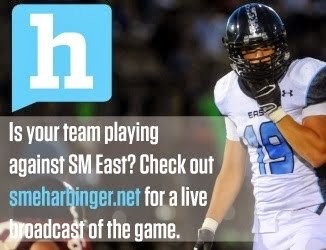 SM East's Connor Rellihan. KC Star. 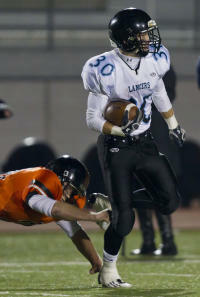 SM West: The Vikings would be the kings of consistency if it weren't for Olathe East. The program has had a winning record for eight straight seasons and finally overcame a pesky playoff hurdle, beating Leavenworth in Regionals last season. Olathe North: Gene Wier. That's really all I need to say. The ingredients on the Olathe North football program are fairly simple: The Best Combination of Athleticism and Size in Johnson County - just add water. Or in this case, just add Wier. SM East: I fully expect "Jordan Darling to Connor Rellihan" to be the proverbial saying anytime the Lancers face an opponent. We'll see quite a few touchdowns through the air from SM East this season and if they can play a little defense you never know how far they'll go. SM Northwest: With most programs the talent meter rises and falls about every five years. After a plethora of talented players went through SM Northwest in the late 2000s (Alex Carder, Mark Fancher, Bryce Atagi, etc.) the program hit a bit of a lull, and has only combined for 15 wins the past three years. 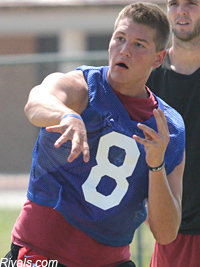 Can the Cougars turn it around in 2012? SM North: Losing Mason Perez to graduation is not going to be easy. He was the heart and soul of the Indians in 2011 contributing big plays and touchdowns left and right. It's been seven years since SM North had a winning record, but that won't stop this year's team from competing with effort and intensity the way they always do. Olathe Northwest: The whole Dalton Rook, Connor Middleton and Willie Cauley trio was fun last season, but all three will be lost to graduation. Coming off a 5-5 season this really could be a make or break point for the Ravens. They're teetering on the middle of the see-saw--on one side is continued success, and on the other is the two and three wins seasons they were accustomed to in the past. It'll be interesting to see which side they fall on. SMNW, With coach Barnett resigning his position today(5-7-12) it might be a little late in the year for a new coach do accomplish much more than installing a new offense this season. But, if it is the right coach and he brings in an up to date offense and a pressure defense I could see SMNW being .500 to just a bit better this coming season. There is talent at SMNW believe it or not it just has to be allowed on the field. What would you consider an "Up-to-date" offense? It seems the state championship trend (Olathe South, Wichita Heights, Hutchinson) is to run "Out-of-date" offenses such as the Wing-T and Flexbone Option. An "Up-to-date" offense to me would include this new thing called the forward pass. In case you have missed SMNW play the past several years they rarely throw the ball. Take last year as an example; the one time they threw a slant over the middle it went for 50 yds. and a td. They never went back to that play. 70% of SMNW's plays are runs and 80% of those are off gaurd not tackle and less than 5% are to the wide side of the field. Make no mistake SMNW has athletes on the football team some of them just NEVER see the field. I am hoping the next coach is not as beholding to some of the boosters that "HELPED" rasie funds $$,$$$ YEARS ago as this staff was. Sounds like MahValley has no idea what he is talking about. I have been on the booster club for the past 5 years. Nothing even close to what you are claiming to have happen is true. Sounds like sour grapes on your part that your son probably watch from the side line most of the time. Was coach Barnett's offense very plain? Hell ya it was! Was there some talent there to throw more? Yes! Doesn't mean he let anyone influence the way he coached. In fact he was probably to stuck in his ways that no outside influence affected him. You may not have liked his coaching style, but don't try and question his character. He is exactly the type of coach you want teaching young men at the high school level. That I can guarentee you!!!! Child Please, if you have been around that long then you know what has been going on as well as I do. Personally, I think that Coach Barnett is basically a good person but he does have to deal an administration that has certain priorities when it comes to football and boys basketball. And if you think that there is "some talent" on this squad than YOU have not been paying attention. There was enough speed to run the ball outside, throw over the middle, run up the middle w/fullback and guard(s)/center as lead blockers, run bootlegs, naked boots, end-around just to mention a few plays that were rarely if ever used. And this is just the offensive side of the ball. 4 and 5 win seasons should be down side records with the kids on this squad. P.S. I would like to thank you personally for bring kids into the discussion. THANK YOU. MahValley, Not that I'm totally disagreeing with you, but if you talked with Coaches Dreiling, Wheeler, Gourley, and Biehler, (all whom wear at least one KS state championship ring) they nickname him "Air Barnett" for passing 30% of the time. My simple point, "modern" offenses don't always, or often, lead to State Championships in KS. Unless you're Blue Valley. When Barnett had a QB (Carder) he threw the ball. Run what you can within your talent level. I think he knows whether or not he had a good enough QB to chunk the rock.